This giant football fan at 5. 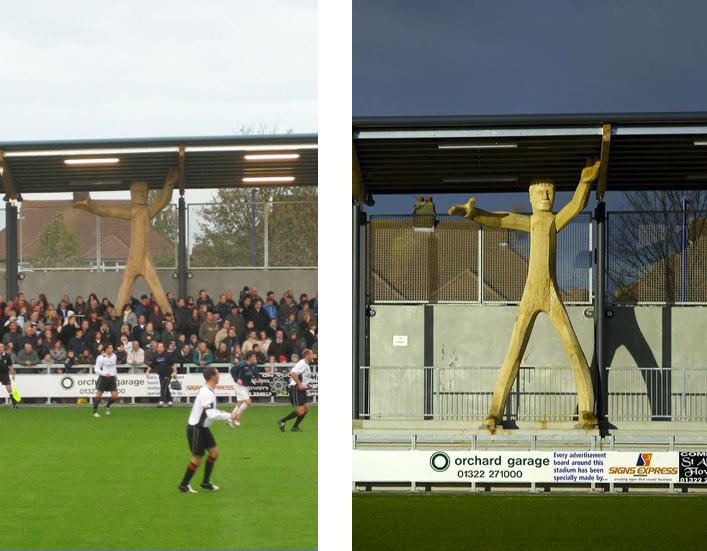 5m high was commissioned for Dartford’s new stadium. The figure also embodies the green principals of the stadium’s design by architect Mei-yun Valdivia a l'Onions of Alexander Sedgley Urban Edge Studios. He is made of green oak from Lydney Park, Forest of Dean where Phil was able to select the tree best suited for the sculpture. Transportation and installation was by Damon Bramley under Phil’s direction. Apologies to the photographers who took these two photos, we have lost the details, and after searching on the internet have not found where we got them from. Please e-mail us, and hopefully you will give us permission to use them here and we can put on the photographers credit and link. Move mouse to see Phil's photo of the sculpture just after it was installed.